After completing an M.A. in Bible from Bob Jones University in May 1977, Mark was burdened to continue his education. While continuing to pastor a small church in North Carolina, he began pursuing a doctoral degree. During this time, he accepted a call from Mount Calvary Baptist Church (Greenville, SC) to serve as a part-time associate pastor along with then-Pastor Jesse Boyd, a man with 40 years of pastoral ministry experience whose influence on Mark had already been formative. Soon he began teaching full-time at BJU, eventually teaching both Bible and Homiletics on the undergraduate and graduate levels. After three additional years, he completed a PhD in New Testament Interpretation in 1983 with a dissertation on “The Matthean Genealogy and Birth Account of Jesus Christ." For the next five years, he taught full-time and faithfully assisted Pastor Boyd as one “who poured water on the hands of Elijah” (2 Kings 3:11). In May 1989, Pastor Boyd handed over to Mark the reins of the ministry of Mount Calvary Baptist Church. At this point, he greatly reduced his University teaching role and became the first full-time pastor in the church's 27-year history. Since that time, God has expanded Mark's ministry and provided even broader opportunities of service for him. He and his wife, Linda, have raised three daughters, all of whom are now married: Abigail, who is married to Dr. Nathan Crockett; Esther, who is married to Sam Arnold, and Lydia, who is married to Ethan Hamilton. Mark is not only a pastor to his congregation. He regularly visits international mission fields to aid and encourage missionaries, serves on the boards of Gospel Fellowship Association Missions and the Fundamental Baptist Fellowship, and serves as a member of The Committee on the Bible’s Text and Translation. The Lord continues to use Mark's pen as well as his voice. 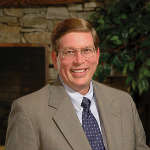 He served as a contributing editor to the Biblical Viewpoint (published by the Bible Faculty of Bob Jones University) and currently serves as a contributing editor to FrontLine Magazine (published bi-monthly by the Fundamental Baptist Fellowship), where his “First Partakers” column encourages and challenges men in the ministry. Mark's philosophy of ministry places a priority on serious attention to the precise, systematic exposition of the Word of God, coupled with an emphasis on faithful, systematic community evangelism—taking the Word to the world. His passion is to seek and to display the glory of God revealed, through the Bible, in the face of Jesus Christ.